​We expect the south to be a new beast. The trail cuts through the spine of the South Island skirting to east of the Alps starting with the Richmond Ranges. The next 600km is remote, rugged and off grid. The route will pass through three small settlements; St Arnaud, Boyle village, and Arthurs pass before reaching the more major settlement at Lake Tekapo. At each location will pick up our pre organised food packages and then hunt for any potential cafes or dairies. Until then, our research suggests no phone signal so we suspect our communications will be limited. We are heading deeper onto the wild. The dangerously beautiful mountains are calling. (P.S. The prolonged exposure to trail food may bore me to death before Lake Tekapo; pray that we find a Cafe). I was asked by a stranger on the ferry a few days ago what my highlight would be from the North Island. Not an uncommon question and something we talk about whilst we walk. It's easy to pick out great moments; views, wildlife, weather, random experiences, friendships and unbelievable kindness from strangers. However this time the question got me thinking, possibly over thinking as I often do. This journey is often difficult to put into words, hence why we are so behind on the blog, and especially because neither of us are naturally gifted writers (thank god for spell check). Looking back on all the adventures from our previous 1,700 km of walking I realised just how far we had come, and not just the ridiculous distance. I hadn't realised just how far I had fallen, just how far I was away from the person I wanted to be. I did a good job of covering it all up and just keeping on, even convincing myself I was doing ok. Not till I had spent a while out of my comfort zone and past my breaking point did this realisation happen. To live out of a bag is a humbling process, to go back to basics (although some kit in my bag is far from basic). Perhaps it's having the time to think, walking can often be a little boring and although we have a good laugh hours can pass without a word being said. Thinking can be dangerous, but sometimes having a bit of time to delve deep is very beneficial. With all this babbling I guess I'm trying to say, without being too hippy about it, my highlight of the North Island has been gaining back a lot of the self confidence I had lost. I had only slept in my tent three times before flying out here and I had never been on a walk for more than two consecutive days, I now find myself a semi professional at pitching my tent and 1.7 million meters from where I started this walk. I also have some wiry facial hair and leathery feet to accompany this. Lows of the trip have been few and far between but getting sand everywhere and the severe lack of actually waterproof 'waterproofs' are definitely the two that come to mind. I guess if I were to try and sum it up I would say; tough, amazing, and hugely rewarding. Let's see what the rugged south has to offer. The Turner - to be known by my new trail name of 'The BFG' from now on (new island, new name)! ​Having Dad here has been a blast and I think he has managed to get a broad perspective of trail life. I have tried my best not to break him though I dont think he can be broken really. All our fellow trampers commented on his grit through the ranges. The ranges were difficult for us and we have had two months of conditioning, this just highlights his ability and attitude. Nonetheless, I should mention his lack of drinking stamina after passing out at New Year! I will be miss his company dearly but I suspect he ready to bin off the trail breakfast and return to eggs and toast. ​The whole week on the Queen charlotte did not disappoint; fantastic views starting with a four-hour ferry crossing as it weaved through dramatic New Zealand mountain countryside. Then into Captain Cook country a real treat as the pictures will show this was a more established path unlike the previous week and really spectacular I guess what you imagine New Zealand to be like and the weather also did not spoil the show. I wish them well and thank them for a great holiday, or should I say endurance test? I can still report no blisters. Biggest moan the menu. Kit report I lost shorts a belt and flip flops (on the kayak adventure) never used waterproof leggings always walked in shorts. Boots are a little worse for wear and were repaired with glue and plasters. I also bent walking poles on the brutal down hills. Finally, my socks are very smelly. A special mention to my Son for avoiding the embarrassment of watching an old man struggle with putting on his pack each day. Credit to him he lifted up my pack every step of the way on every single occasion we stopped and Oh did I need the help. Without it he might have broken me. The pack weight in at the airport at 18.8 kg without water. It has had all my worldly possessions for a month and slowed me on hills and pushed me down hills I did not want to go down. But for me mission accomplished. I look forward to seeing the champagne at bluff when they finish. A real pleasure thank you both. Back to civilisation after eight days of tough hiking in Taraua mountain range. The eight days of kayaking in the wilderness was easy compared to this. The mountains are a mixture of dense forest and thick mud along single narrow tracks. These mountains are spectacular and beautiful but also dangerous. Only last week two guys in there 30's died of hyperthermia, the Tararua range of mountains claims lives every year. According to Luke & Tom this is and was their hardest section yet. "Thanks lads". Tom was not joking when he said he would break me. I can report I was slow on some sections but still no blisters. Gas and air would have been welcome on the exposed ridges. The knees are aching after so many ridges and valleys. Even my boots are showing considerable wear after one weeks hiking. A repair job will have to be made before the next hiking section. The Queen Charlotte range just south of Wellington on the South Island. Where are you going mate? Once he knows where they are going job done. He explains that where we are going The result being two minutes into prowling the car park Tom has ambushed two young ladies totally filled their saloon Car with two ruck sacks in the boot and Tom me and Luke in the back sets with one Ruck sack on our knee's suspension on the floor and trip to the pub all within a blink of an eye. After the celebrations of New year’s Eve. Tom and I made it to Wellington for New Year's Day. We spent a sneaky night in a hotel yippee (bliss), hot water, clean cloths, a film and no trail food (after all I am on holiday so not feeling guilty at all). Luke needed another day in his sleeping bag following a late night and was not up for travelling and would join us the next day in Wellington. Wellington was very quiet and most things where closed. the city had a feeling of celebrating the night before so Tom and myself had a little quiet night in a bar. In the Morning Luke joined us I think a little fragile but fine. The plan on my final week was a hop over to the South Island to walk the picturesque Queen Charlotte track for a four-day hike. Distance = 8km. Total = 1577km. Smell Factor =7/10. Knowing the day was going to be a big one we set the alarm for 5:30. In a small hut it was very difficult to pack everything and get ready for the day without disturbing everyone else, especially when you're a lanky sod. There was a chill in the air and the spectacular view from last night was now non existent, just that familiar white cloud nothingness. We left camp around 7:30 and spent the first couple of hours climbing to the summit of Mt Crawford, the climb was fairly steep and nerve wracking in places with narrow ledges and sizeable drops. Once again we were denied a view from the summit by the cloud coverage and so we just pushed on and passed the summit with no fanfare. It was exposed at the top; the morning chill was not going anywhere and the breeze was picking up. We knew the descent would be steep and tough on the knees but we weren't aware it would be to such a painful extent. Stopping regularly helped but getting going again became increasingly tough. After crossing a rather dodgy swing bridge we eventually reached our lunch stop with knees either creaking or on fire. At the hut we were informed that the next section would be a couple of hours longer than we had planned due to a massive landslide. We had to decide weather to push on or stop and change our exist plan for the ranges. A decision like this is not easy and after some deliberation we eventually decided it would be best to have lunch and decide after that. It had already been a big day and our knees were pleading with us to stay. Colin was asleep 10 minutes after the decision had been made and although he showed willing to carry on it was clearly the right decision to stay. After a freezing cold wash in the nearby stream I snoozed away the afternoon and rested my overworked knees. Once roused from my slumber I only moved a few meters and sat myself by the wood burner, not even the horrendous smell from the drying rack above my head could move me. The descent had taken its toll on all of us and so it was a quite night for everyone in the hut. ​Distance: 8km. Total: 1564km. Smell factor: Wet/10. The weather was not what it was yesterday. The clouds had closed in and it looked dank outside the hut. Today's walk was the most exposed of the whole mountain section and we would need to battle through the weather to achieve the aim of 13km (Nichlos hut). The five of us left together but it was wise to let Emma, Harry and Luke push on beyond us so they could keep warm whilst walking at their natural pace. Luke handed me the stove in case of an emergency and they walked on. Dad and I would not see them again until late afternoon. The beginning of the climb was steep and taxing but the weather held. Gradually as we approached the ridge line the wind grew in strength. We both sheltered behind a rock and added a few more layers. Our timing was impeccable. We then approached the next climb and found ourselves exposed to the elements. At the top we saw a lonely signpost violently rocking. As we drew close we were immediately hit by the same full force of the wind. My hood, hat and buff was ripped off my head in one swift move though I luckily retrieved my hat. Both knowing the dangers of such wet and windy weather we ploughed on never stopping long. Dad was maintaining a good temperature but I was getting chilly going at Father Hobbits humble pace rather than my own. We were both soaked through. The ridge line continued for an age offering only tough muddy walking terrain with the weather never letting up. Finally, it dropped into a tree line and we could gobble some pre prepared lunch. In my head I was already strategizing. I was not keen to continue beyond our lunch spot; a two man bivy hut (an emergency shelter). I was aware of my temperature and the time of day. Our current pace was 1km/hour and with 9km more until the intended hut it was foolish to consider. Nonetheless, I was apprehensive to whether Luke would recognise the dangers having pushed on at a faster pace and unawares to my difficulties. The dividing of food meant the meals were split between our bags and our meal would be far from ideal if we were forced to stop without Luke. The last hour dragged on and every corner taunted me with the prospect of a dry hut. 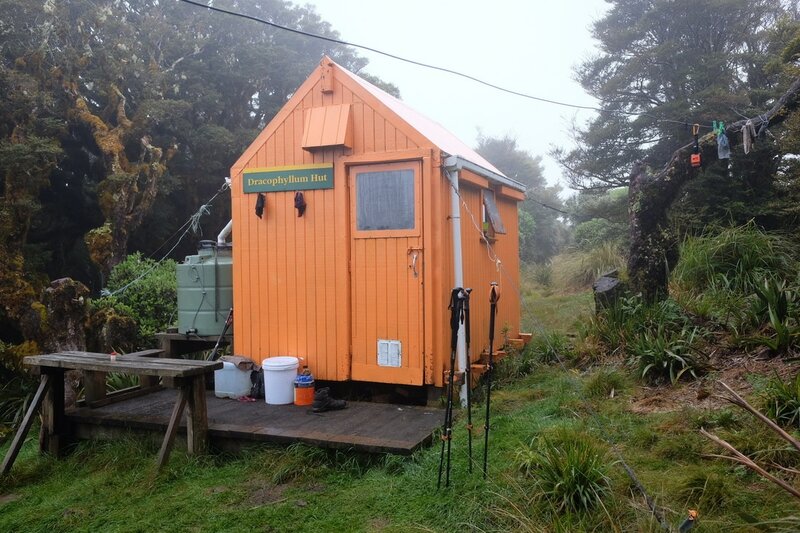 Eventually, the bright orange hut appeared in the mist and I saw the familiar boots and bags of my fellow trampers outside the door. Luke quickly emerged and stated his intentions; the exact same as mine. Our plans aligned as did the day's difficulties; he described how Emma had actually been picked up and thrown over by the wind. It was a no brainer to stay in the hut and finish that days walking. Luke and I rarely disagree and often have similar approaches, this was no different. The strength of our teamwork shone through again. The minor obstacle to be faced once Dad and I stripped down and warmed up was how to fit 8 smelly hikers in a two bed emergency shelter. We were not alone in our intentions with Emma, Harry and three others; Mary, Dan and Sam deciding on the same plan. For the next few hours we chilled out and warmed up whilst speculating how we would squeeze us all in this puny hut. We decided on a plan. Emma and Harry took bottom bunk. Dan and Mary took top. That left floor space for four. Sam slept under the bed with very little space. I snuggly slept under the work bench, Luke slept in between and Dad was allowed the door space for midnight wee visits. It was all extremely snug but better than the outside. Just another trail experience. 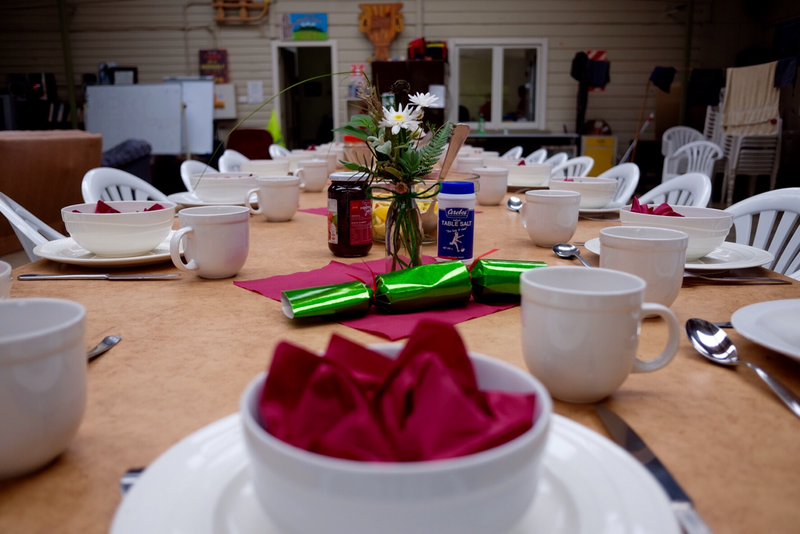 ​Hiking though the Tararua's We spend three nights in our tents and Christmas Day at the wonderful makahika activity centre. The next four nights we stayed in huts high in the mountain range as tents are not suitable so high up. The huts varied in size, style and condition. Basically the huts have bunk beds a cold water tap and an outside toilet. Some have wood burners but most but finding DRY wood can be a challenge however Tom and I know how to light fires. All in all, no hotel or holiday Inn creature comforts here but they are just what you need after a day’s hiking. Generally, the three of us Tom (our leader), Luke and myself hike together. There is a group of about 17 of us that meet or have met at various section sometimes a group will finish early due to poor weather or another group might push due to being faster hikers. After our first hut we climbed higher on to a very exposed ridge and faced very wet and strong winds most of the day. So windy Luke’s ruck sack cover was ripped off. So when we arrived at the second hut some of our fellow hikers had decided to stop for the day and take cover from the weather. This led to a very interesting night. A very small hut designed to sleep two with one bunk bed. Problem being there was now eight in our party It was a somewhat of a cosy night as eight of us slept in a hut no bigger than an average Garden shed. With Wet hiking gear, eight pairs of smelly socks in a very confined space you can imagine fresh air was welcome in the morning. I think sardines get more space. With bellies full and spirits high we made our way back onto the trail around 10 ish. We had spent a good part of the morning giving our hikers paradise a real good clean, it was the least we could do after being treated so wonderfully. On our way up the drive Sally invited us in for one last coffee before braving the Tararua Range. Obviously Tom and Colin were keen for a last decent hit of free energy from the bean and I was more than happy to re connect with the world via wifi. Tom and Colin's wish was granted but unfortunately my phone did not play ball. After saying our final goodbyes to our exceptional host we headed on to the trail, albeit slightly begrudgingly. It was a scorcher of a day and the first road walking section was spent talking over how great the last couple of days had been. As we turned off the road we passed a couple of signs indicating the dangers of the coming few days, this was on top of already knowing a couple of hikers had died on the coming ranges only a couple of weeks ago. With some trepidation I tried not to think about it too much and have faith in my ability and the ability of those around me. The start of the track was beautiful and we quickly began ascending into the hills. The heat was growing as we continued to climb, the foliage offering a nice shade from the direct sunlight. We were rewarded for our climb with some incredible views, for once we could actually see more than 10 meters in front of us. The views continued to amaze as we carried on climbing. I managed to find some signal briefly and I made the most of it to wish my family a Merry Christmas. The time difference meant that it was still Christmas Day for them. It was great to speak with them all and it really lifted my spirits but it did also heighten my awareness of how far away I am from them along with how mad they are. During our brief ten minute conversation the main topic and the focus of many jokes was that I was heading to a peak known as 'Richards Knob', I'm sure you can imagine how the conversation went. It was early evening by the time we reached the hut and the clouds had started to roll in, adding that familiar mystical feeling to our surroundings. The others had arrived earlier and were well set up. With the light fading it was time for dinner and falling asleep followed shortly afterwards. Whanganui - Wellington (Day 85 & 86). The morning was quite relaxed and without the exchange of gifts we went straight into having breakfast, a gift in it's self. 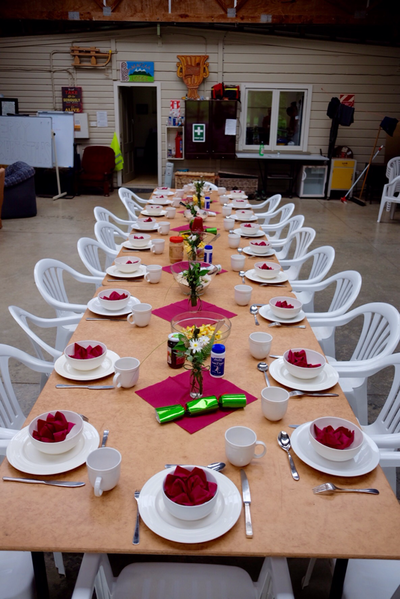 The others has decorated the tab,e beautifully and had gone all out to make the most of the celebration. We had all agreed to do something each for breakfast and so we had an amazing mix. Tom and I did scrambled eggs and toast, Kate made a wonderful muesli, Bibi made a fruit salad, and Sally came down with bacon. 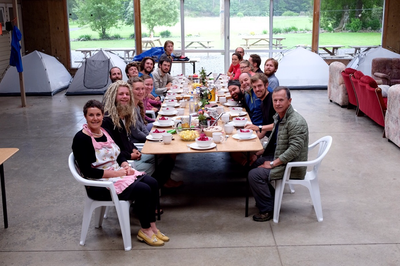 We had Christmas songs on in the background and we all sat down as a trail family, Sally and John also joining us. With everyone in good spirits there was a great atmosphere, lots of laughter and story swapping. We had a mass wash up afterwards and we all did our own thing for a little while. Sally cooked the most amazing banquet for lunch and we reset the table and sat down for lunch at about 3. There was roast turkey, pork, and lamb, as well as a giant ham, roasted vegetables and some amazing salads. We all served ourselves in the kitchen and went through to the hall to eat. Again the atmosphere was great and we all sat in a different place to breakfast and so the story swapping continued. I managed two full plates of incredible food, both washed down with beer. Another mass wash up followed, I played some music through the speaker and we all sang along as we cleaned up. Once everything was clean we had a game of pictionary, everyone getting involved. Although the weather wasn't the best some of us went out for a volleyball rematch to burn of some of our dinner. Surprisingly Julian & Pauline arrived in the early evening and having not seen them for over a month we spent the majority of the evening catching up. It was a great alternative Christmas and one I won't forget. Having thought I wouldn't celebrate it at all just sitting in a hut in the hills somewhere we actually managed two Christmases on this hike, not bad considering it still doesn't feel at all Christmassy. Distance: 18km, 22km, 22km. Total: 1538km. Smell factor 6/10. After our seven-day kayak it was good to relax at the holiday park. 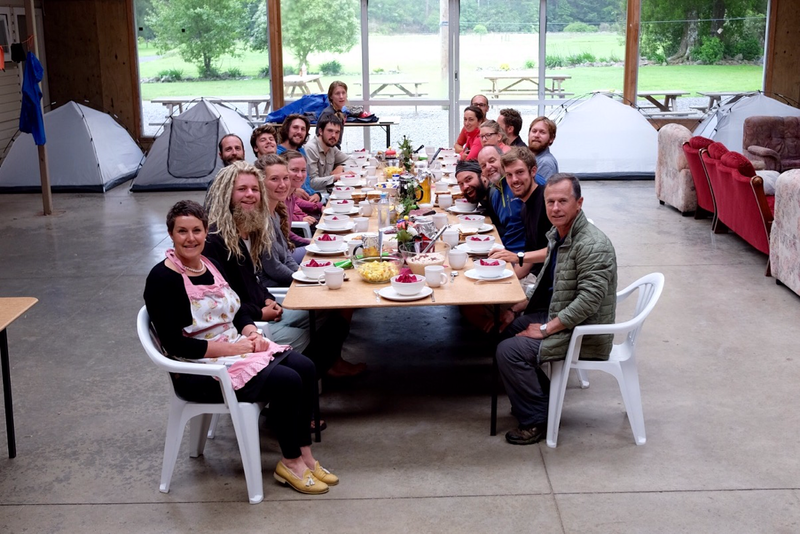 We cleaned clothes, showered and felt normal after the physical exploits of the week. So working on the blog and their own personal diaries is limited between the narrow times of having internet access. After a good night’s sleep we all went to Whanganui to shop for next week’s hike. I can report my moans have been answered. Breakfast now comprises of dried fruit, milk powder and honey; yum yum. The trip also involved a visit to the cinema to see the new Stars Wars film that the boys where really keen to see. The film must have been good as I did not fall asleep which I have a habit of doing. Clearly Luke and Tom have built a good relationship with various hikers at different times of the walk and it is like a big family. Emma and Harry from New Zealand have become there walking mates who are also good company and obviously useful for local information. Following our time off, I managed my first three days hiking of our eight-day section. Oh boy this hiking is tough. However, I can confirm am not broken yet. No blisters and although the packs are heavy with eight days’ food I am loving the whole experience. I know compared to them I am a bit slow on hills; similar to the crawler lane for lorries, the lads are like sports cars waiting for me at the top while I puff and pant. I do get there eventually. The boys are being good to me. Tom always lifts my pack up so I can put it on without the struggle, oh to be 23 again. 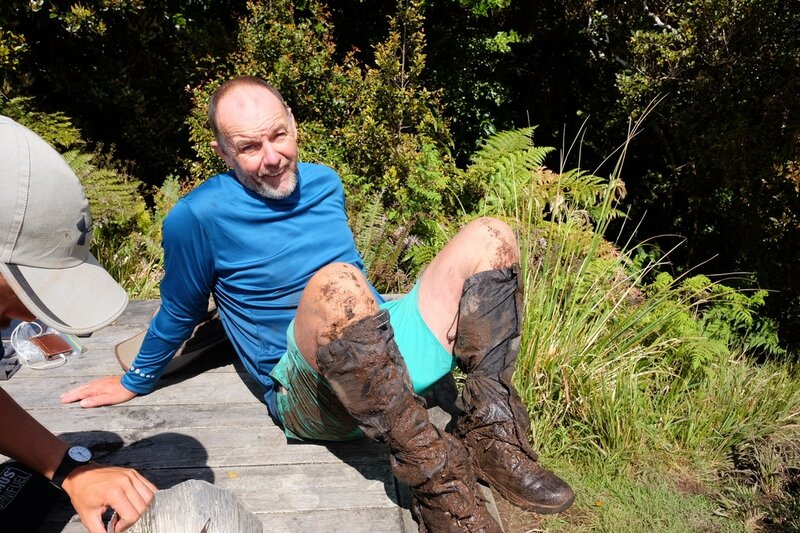 The mud on some of the forest walks are unbelievable without poles you are heading for some serious tumbles. Tom had been successful in pleading enough with the bus company so that we didn't have to pay to change our schedule, I put his success down to his lack of facial hair and his ability to sweet talk old ladies. We arrived in Palmeston North, a pleasant looking town which clearly had some money, in the early evening. We made our way to the campsite with our very heavy packs and got in just as reception was closing. Whilst we pitched Tom was stuck talking to the local campsite weirdo, all of them have one, and we seem to have met them all. This particular chap managed to insult almost every nationality in the 10 minutes he talked at Tom, with every other word being 'ironically'. Tom did a great job of just nodding every now and then as he pitched his tent and set up his bed whilst Mr Ironic wouldn't shut up. Colin and I found this very entertaining but eventually I set an alarm off on my phone and pretended to answer it, handing the phone to Tom as it was a call for him. The rest of the night was spent trying to avoid Mr Ironic and so it was early to bed in the safety of our tents, separately! Blog updated until Day 93.